The Indian Constitution was adopted on the 26th November 1949 and we celebrate this day as Law Day. Constitution came into force on 26th January 1950 to commemorate the Declaration of Purna Swaraj by India on the same date in the year 1930. The Constitution is a result of the members of the Constituent Assembly who took precisely 2 years, 11 months and 18 days to give us this beautiful piece of legislation. The Indian Constitution is the longest written Constitution of the World. 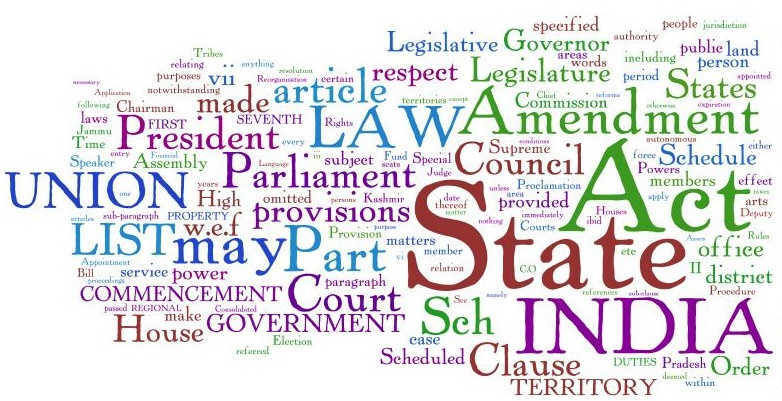 From the CLAT perspective, the Constitution is something that you must know. Not the whole text of course!!! But, the basics. The Indian Constitution has been amended for 93 times now and some of these Amendments are very important for your Exams. So, give a thorough reading to the below-mentioned. You must know the Amendment Act (for eg. 42nd Amendment), the Year of the Amendment Act and the change brought about in the Constitution. Remember… The amendments given below are important and frequently asked in CLAT. However, you are advised to at least take a glance at all the other Amendments. First Amendment Act, 1950: Insertion of new grounds of restrictions to the Fundamental rights under Article 19. Insertion of Art. 31A and 31B and the Ninth Schedule to give protection from challenge to land reform laws. Ninth Amendment Act, 1960: This amendment was necessitated in view of the Judgment of Supreme Court in Re Berubari Union to give effect to the transfer of certain territories to Pakistan in pursuance of the agreement entered into between Governments of India and Pakistan. Tenth Amendment Act, 1961: Amendment of Article 240 and the First Schedule to include the areas of Dadar and Nagar Haveli as a Union territory. Eleventh Amendment Act, 1961: Amendment of Articles 66 and 71 to provide that the election of President and Vice-President could not be challenged on the ground of vacancy in Electoral College. Twelfth Amendment Act, 1962: Amended Article 240 so as to include Goa and Daman & Diu as a Union territory. Thirteenth Amendment Act, 1962: A new Article 371A was added to make special provisions with respect to State of Nagaland in pursuance of an agreement between Government of India and Naga People’s Convention. Twenty-first Amendment Act, 1967: Sindhi language included in the Eighth Schedule. Twenty-fourth Amendment Act, 1971: This act amended Article 13 and Article 368 to remove all doubts regarding the Power of Parliament to amend the Constitution including the Fundamental rights. It was passed after the verdict of Supreme Court in Golaknath’s case. Twenty-fifth Amendment Act, 1971: Amended Article 31 in the wake of Bank Nationalisation case. Forty-fourth Amendment Act, 1978: Right to property was omitted as a Fundamental right and now has a status of a legal right. Article 352 of the Constitution was amended to provide “armed rebellion” as one of the circumstances for declaration of emergency. Fifty-second Amendment Act, 1985: Anti-defection law was introduced. Fifty-sixth Amendment Act, 1987: Goa was conferred the status of a State and Daman & Diu as a new Union territory. Sixty-first Amendment Act, 1989: Amended Article 326 reducing the voting age from 21 to 18 years. Seventy-third Amendment Act, 1993: A new Part IX relating to the Panchayats has been inserted in the Constitution to provide for Gram Sabha, Village Panchayats, direct elections to Panchayats and one-third reservation for women and other things. Seventy-fourth Amendment Act, 1993: A new Part IX-A relating to Municipalities to provide for three types of Municipalities: Nagar Panchayats, Municipal Councils and Municipal Corporations. Seventy-sixth Amendment Act, 1994: SC in Indira Sawhney & ors. v. Union of India ruled that the total reservations under Art. 16(4) should not exceed 50 percent. The Tamil Nadu Act which provided for excessive reservation was brought under the Ninth Schedule of the Constitution to get protection from the judicial review. Eighty-sixth Amendment Act, 2002: Insertion of new Article 21A making the Right to Education (Free and compulsory education to children between 6 to 14 years of age), a Fundamental Right substituting the Article 45 (DPSP). It also inserted a new clause (k) in the Fundamental Duties regarding the duty of parents or guardians to ensure the opportunities of education for their ward. Eighty-ninth Amendment Act, 2003: Insertion of Article 338A to provide for a National Commission on Scheduled Tribes. Ninety-second Amendment Act, 2003: Four languages namely, Bodo, Dogri, Maithili and Santhali were inserted in the Eighth Schedule. The total number of languages in the Schedule is 22.